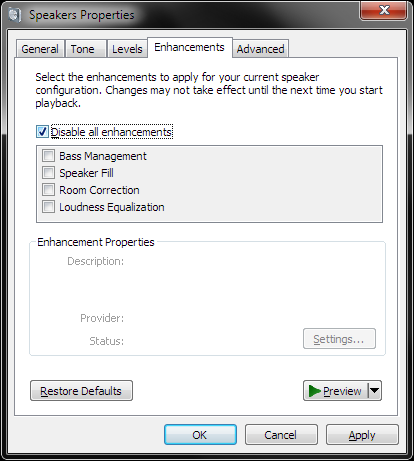 Whether or not you have the 'Enhancements' tab is down to the particular audio driver that's installed - some allow this feature and some do not. Download the IDT Audio installer and save it to your Downloads folder. Open up Sound, Video and Game Controllers. Right click the IDT device and select Uninstall - you should also get a prompt to remove the current driver, tick the box to allow this and then proceed with the uninstall. When complete, restart the notebook. 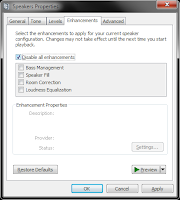 Let Windows fully load - it will automatically load an audio driver, but just let this complete. Right click on the IDT installer and select 'Run as Administrator' to start the installation. When this has completed, check if you have the Enhancements tab back. Note: If you want the fn+B combination to work correctly, you'll need to download and install HP Quick Launch. When the installation has completed, restart the notebook before checking.